Bender makes this announcement in “A Clone of My Own” after Professor Farnsworth disappears. He musters a modicum of concern for Farnsworth—provided it doesn’t get in the way of bettering his own life. Bender always has his priorities straight, and priority number one is always Bender. In the future, home brewing beer will evidently still be popular. It’ll just take place within the chest cavity of a sassy robot. What really makes this such a memorable quote is how chipper Bender is when he says it. 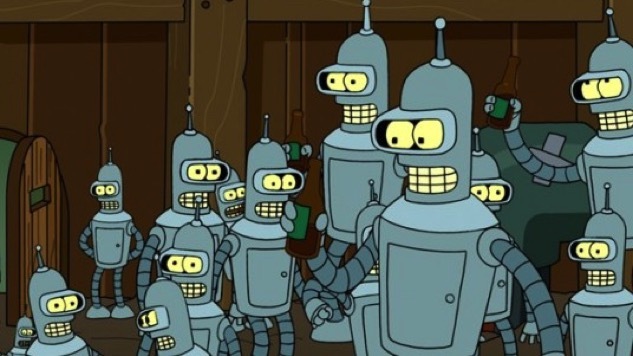 By inventing “jacking on” in “Hell is Other Robots,” Futurama gave itself an avenue for drug jokes and masturbation jokes. Here, Bender imparts a valuable lesson on peer pressure. Always do something that will make you seem cool. Being cool is to be prized over everything else. Bender may be a hard drinking, cigar smoking, carousing robot, but he still has self-esteem. When something punctures that self-esteem, he gets embarrassed. When he’s embarrassed, he wishes he could be all by himself. The most logical way to make that happen, of course, is for everybody else to do him a favor and die. Bender knows he isn’t a good role model for children. So when kids start watching him on All My Circuits and mimicking him, he knows the time has come to impart a lesson to the parents out there. This is the bulk of Bender’s advice. Has anybody ever told you that you don’t own John Larroquette’s spine? It hurts, doesn’t it? Bender just wanted to be able to put those naysayers in their place. If he gets one more skull and completes his Mouseketeer reunion, even better. Granted, Bender says this in a dream. But it still gets to the heart of his romantic side. What robot woman doesn’t want to find true love during a night out, killing all humans? Bender knows how critically important it is to sound cool. When you do anything, criminal or otherwise, the letter ‘x’ can really spruce things up. Lots of people have ants in their pants. Bender, however, has a real flare for the English language. Also, he doesn’t usually wear pants. When Bender is turned away from entry of a lunar lander, he immediately sets a lofty goal of creating an even more glorious lunar lander. Then he gives up on every part of his plan save one. Then he just gives up entirely. Staying motivated is tough. Bender is able to win big in a horse race after every horse except his is shot up with downers. It just so happens that Bender is also the one who shot them up. Still, it’s an important anti-drug lesson for the kids. Bender says this in response to being told that he will like being dead. At his core, Bender always remained the robot who Fry met in line for a suicide booth. Bender sells his body for cash. Though he is then just a head, he feels pretty high on the hog. As far as he’s concerned, he’s won at life—even when a dog uses him as a fire hydrant. The holidays can be tough, especially in the future where you have to worry about a murderous Santa robot killing you on Xmas. Bender, though, is able to relax with a little booze, and appreciate his life for what it is. When Bender finds himself hurtling through space, he’s able to be wonderfully poetic about it. Fortunately, he had his piano and candelabra with him, which allowed him to compose this simple verse. This is not Bender’s only catty quip about fashion in the history of the show. Bender may not ever wear clothes, but that doesn’t mean he isn’t entitled to his opinions. Bender clearly has a fine ear for music. He knows where Spin Doctors “Two Princes” falls on the rock spectrum. If you change his radio station, he will know. Bender knows what the creators of Futurama knew. Robots make everything better. Here, Bender reacts to Fry’s Holophoner opera, which features a scene where Bender does, in fact, fight Godzilla. Or, rather, he tries to get out of the fight by pretending he has a doctor’s appointment—which, frankly, is the smartest way to fight Godzilla. In a dream sequence, while he is made of wood and waging war on technology, Bender utters these powerful words. Clearly, his plans were ambitious. Rush doesn’t chronicle just any old attack on technology in song.